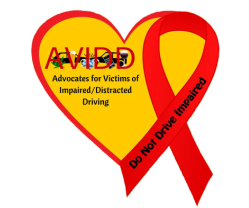 Bill and Julie Downs, founded AVIDD-Advocates for Victims of Impaired/Distracted Driving in 2008, formerly known as Victims of Impaired Driving Support Group on facebook, after the loss of their 3 kids due to a drunk, drugged and texting driver. The driver was also killed in that crash. It was strictly an online support group for victims and survivors of Impaired Driving. The Downs' later formed two on line support groups; one for people who had lost loved ones to an impaired driving crash and the other for victims involved in an impaired driving crash and survived. The Downs' became involved with MADD (Mothers Against Drunk Driving) as volunteers on the Mississippi Gulf Coast. After 6 years of devoted service and investing thousands of dollars of their own money; MADD abruptly discharged the Downs'. They say when one door closes; another will open that is even better. MADD had no idea they were doing the Downs' a favor. The Downs' contacted the former founder and president of MADD, Candace Lightner and her words encouraged the Downs' to move forward in what the Downs' were already doing with the support groups. Candace Lightner suggested to the Downs' to turn their online support groups into an international organization supporting victims all over the world. At this time they have members from the United States, Canada, Australia, and South Africa. The Downs' believe that God has taken the horrific tragedy of the death of their kids and turned it into a chance to make a difference in the lives of it's members and be a voice for those who do not have a voice. The members in turn are the voice of the victims and will make a difference in society. AVIDD VOICES was created by the Downs' to educate the public and individuals that have been ordered to attend the meetings conducted by AVIDD VOICES. The meetings are hosted by the Downs' and volunteer victims. Victims that have been affected by Impaired and Distracted Driving. The victims have either lost loved ones, been themselves injured or someone they love has been injured by an Impaired or Distracted driving crash. Some of the guest speakers at these meetings are First Responders, i.e. Firemen, Law Enforcement, Paramedics, etc. These meetings will be conducted in a timely manner to make a change in the way attendees that have been arrested think about the effects of driving impaired or distracted. Hopefully when the attendees leave these meetings they will have a different outlook on the dangers of driving impaired or distracted.